I'm continually awed by the ability of brown leather shoes to transform an outfit from ordinary into ... not. Whether your pair them with black skinny jeans, some high-waisted bodycon number, or a maxi skirt, like Libby here, they never fail to skyrocket what might ordinarily have been a normal mundane ensemble (not that Libby's is - because nobody in their right mind would call her accessorizing mundane) into something a bit more visually intriguing. They're like an insta-hipster-upgrade to whatever you happen to be wearing. And Libby knows what's up. Probably because she spent a year in New York City for the Textile and Apparel Design program at UW-Madison. And we all know that everyone from NYC is cool. Generalizations are bad. I'm being funny. Laugh. hehe . 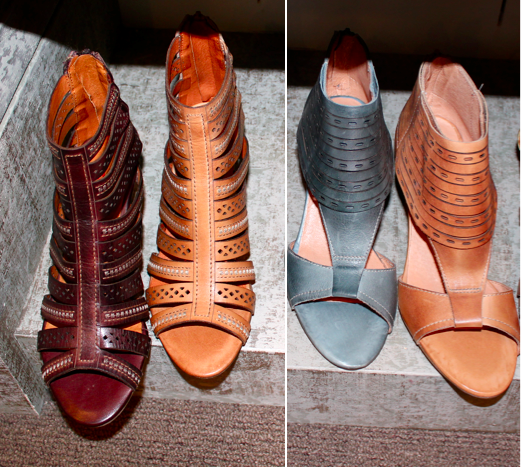 Anyhoot...here are a few of my fave leather foot-cladders from the past couple of months. So hopefully, next time you find yourself stuck in a relatively normal outfit and think, as I know you do, - how can I make this weirder? - maybe you'll consider this post and don a pair of cow-derived oxfords. (or feathers. feathers work too). Hey - I have feet too. In other breaking news: I'm headed to NYC-aka-the-land-of-the-cool-this-is-a-joke-but-not-really this afternoon. You can follow me on Twitter (@looksharpWI) or Instagram (@looksharpsconnie) for updates and what not. I'll try to blog, but if Gosling sweeps me off my feet, no promises. You are right about the shoes – though I love this look head to toe, they totally make the outfit. I love your casual look. Great shoes! thank you very much for your coments;) you look great:) I love your orange shoes! J.